Some years back, okay it was twenty years ago, I did a solo bike trip through the southwest. Sixteen hundred miles in six weeks. You know the deal, you load your mountain bike up with a tent and sleeping bag, and since it was winter I had some warm clothes and a cook stove. Anyway, one day I was feeling lousy. I had chills, a fever. 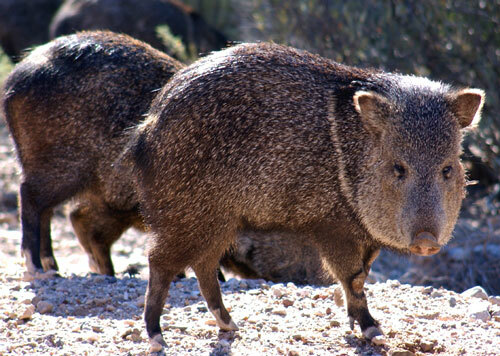 Looking back on it I suspect I had a mild case of the Javelina Flu. I was pedaling my packed bike on a little used road overlooking a small river, searching for a place to pitch my tent. So, I turned down a dirt trail that I thought would lead to the river. I needed water as well as rest. It was a keep-your-breaks-on steep trail that cut this way and that as it plunged toward the river. So what if I’d have to wheel my bike up the hill tomorrow or the next day. I just hoped it’d be a peaceful place to ride out the Flu and get my strength back. At the bottom I rounded a bend and saw dogs. I counted seven of them sprawled in a flat spot by the river. They saw me and got up. Some growled, some howled, and they all started moving toward me. I stopped, and straddled the cross bar on my bike, glancing around in search of their owner. Surely someone had to be around. I mean, come on. Seven dogs. All together. These short-haired, teeth-baring hounds were closing in on me and I couldn’t just turn my fully loaded mountain bike around and beat it back up the hill. In my weak condition it would be a challenge just to push the bike up the hill. I wished there was another person with me, someone to take a stand with, but I was alone. The dogs were twenty feet away now. I got off my bike and for a split second they paused, but then they kept coming. I grabbed a handful of dirt and rocks and threw it at them. They paused again. And then advanced again. I threw more rocks. They paused. And then they advanced. My head was pounding and my throat was sore. And I had a fever. I just wanted to curl into my sleeping bag and rest. But for obvious reasons I couldn’t. I turned my bike around and started wheeling it up the hill. I stopped every twenty feet or so to throw rocks, and that kept the dogs and their snarling jaws just far enough away. I’m not sure how long it took to get up that hill but when I finally made it to the main road the wild dogs retreated. Yeah, I felt like I’d been run over by a train but at least I was alive. When you do revision you’re alone. Sure, maybe you’ve got notes from your critique partners, your editor or agent, but when you hunker down to do the work it’s just you. And sometimes things look dire. Your manuscript is a mess of underdeveloped characters and hanging plot threads. And maybe you even think, I don’t know if I can do this. Maybe I’m just not good enough. It’d be easy to give up and let the wild dogs of self-doubt have their way with you. To let all the voices gang up on you until a pack mentality sets in and they take over, destroying you, ripping and tearing at your confidence until it’s dead. The path might look steeper than it did when you cruised down it while writing your first-draft. Maybe you wrote yourself into a box canyon, and a recent landslide behind you has drastically altered the terrain. The trip back up isn’t going to be an easy turn-around where you just reverse a few things. But every time you make that journey up Revision Road, every time you face the wild dogs of self-doubt without rolling over belly up, you’ll have that experience to draw on. So, when the wild dogs of self-doubt start howling and snarling you can greet them, tell them that they are even welcome to stay for a while and have some chocolate, or a beer, but you won’t be letting them make a meal of you. Instead, you’re going to keep working on that manuscript, rewrite it, change the point of view if necessary, develop your characters, and weave those plot threads together until they resemble a fine silk scarf. Nicely done, sir. I like your writing voice. Glad you found my blog. What tension! I love how you wrote about your experience. It must have taken every ounce of your energy to get away from those dogs. The next time I revise, I’m going to think, “Thank God I’m only revising and not running from a pack of wild dogs!” Thanks for visiting my site. And, I truly love your treadmill laptop. Wow, Paul! Great story, great pictures! That is just frightening! And so very cool. I’m so envious of you! That must have been extremely nerve wrecking. Having just been sick I’m not sure I could have done it. And like Jennifer said, revising sounds so much easier than biking up hill from a pack of ferocious dogs. I would have to agree with the others. A pack of wild dogs? My goodness. Revising is a lonely job. I have been reworking the same novel for over two years. I do not have a critique partner, editor or agent. It is only me. However, I find that I may be my own worst critic. I am never happy. Ha! I’ve actually had two experiences with packs of wild dogs. The other was on a backpacking trip in the smoky mountains. I had a friend with me. We each picked up big sticks but the dogs stayed about fifty yards away. Not as scary as being alone, especially since the dogs eventually moved away from us. Nice. But the pictures kind of creep me out! Thanks for your nice comments about Waiting to Score on my blog! See you are an avid runner. I am a sucky runner. Trying for my first 10km…..good luck with your writing too!! !